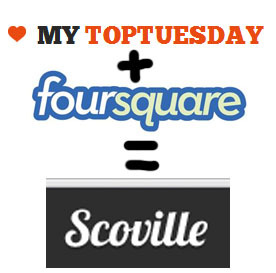 If you’ve been getting invitations to Scoville recently, or saw a rash of #toptuesdays on your Twitter feed yesterday, this article is for you. What is it? Should you care? What is top? why Tuesday? It’s where you share awesome places with your friends, on Twitter. Well the recommendations go out once a week, and the day on the week it goes out on happens to be Tuesday..
Well, if you like going to great places, recommending other great places and, like, getting your friends to go with you this could be handy. Scoville is the name of the scale used to determine the heat of chilli peppers, it’s also a cunning new service built on top of Foursquare. It’s the group that run the TopTuesday hashtag. Remember Foursquare? Of course you do, it’s that location-based social network that everyone loved about 12 months ago, then Facebook Places came along and we all predicted it would die. Well it hasn’t and this little tweak could help it keep going. Why is there a picture of a cow on the website? So the Scoville app is just a twitter hashtag basically? Well this latest tweak is the simplest thing I’ve ever seen. Despite the beta tag and the fancy interface, it is essentially a hashtag – a way of collecting up a bunch of tips in one place and sharing them among a group of people. However a few qualifications: You can only nominate your #TopTuesday from places you have actually visited that week and checked in at on Foursquare. You see recommendations from your friends, but you can also see other ones near you. Like with Foursquare, you get points for doing more stuff – inviting your friends for example. er, what happened with Foursquare if you don’t mind me asking?